It was Karl Marx who said, "Religion is the opium of the people." Like many quotations, it has been taken out of context, part of a much longer discourse on religion in his Critique of Hegel’s Philosophy of Right. It turns out, though, that others felt the same way about religion as a tool of oppression. The Marquis de Sade, in 1797, spoke of "this opium you feed your people, so that, drugged, they do not feel their hurts, inflicted by you." In 1798, Novalis wrote: "Their so-called religion acts merely as an opiate: irritating, numbing, calming their pain out of weakness." Kingsley and Lenin used the term, as well. But even out of context, the narcotic metaphor is quite apt for what's happening during this hottest-summer-ever in North America. Air conditioning, it turns out, acts as a sedative. Without it, people would be up-in-arms angry at their governments. Without A/C, people would need to be demanding that their leaders stop the rise in global average temperature. Without it, we would be seeing action on the climate change emergency. The concept of air conditioning is known to have been applied in ancient Egypt where reeds [that were] hung in windows had water trickling down. The evaporation of water cooled the air blowing through the window, though this process also made the air more humid. In Ancient Rome, water from aqueducts was circulated through the walls of certain houses to cool them down. Other techniques in medieval Persia involved the use of cisterns and wind towers to cool buildings during the hot season. Nowadays, people just flick on a switch or - if they can't afford A/C in their home - go hang out at the local mall. It seems that very few people are having to actually suffer from the heat of this 2012 overheated summer, and we're not quite yet feeling the results of the widespread crop losses. I know that air conditioning wasn't "invented" to ravage the biosphere. Indeed, it's a case of unintended consequences. (Back in 1842, for example, Florida physician John Gorrie used compressor technology to create ice, which he used to cool air for his patients in his hospital.) 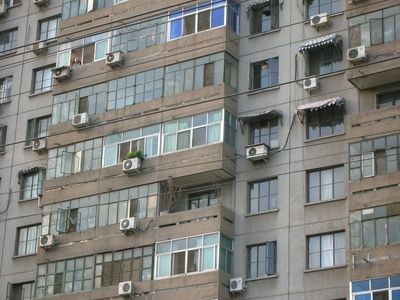 But even forgetting that running all those extra appliances is burning more fossil fuels, and that refrigerants like R-22, a hydrochlorofluorocarbon, are fantastically powerful greenhouse gases (about 1,800 times more powerful than carbon dioxide), the problem is that A/C dopes us into believing that we'll be okay. If you're a conditioner of air, please, stop. Turn it off. * Get hot. Be uncomfortable. Become unproductive. Be willing to suffer a little for the sake of the children's future. Then create some political will. Get angry! Get angry with your politicians and other leaders. They have known for decades that this was going to happen, and they just didn't care. They've done nothing to stop the quickening pace of global heating. And frankly, I'm starting to believe it's because they've got air conditioning, too! * If you truly believe you cannot turn off your A/C (literally for fear of dying ... remembering the tens of thousands who perished in the European heatwave of 2003), then at least turn it off during the day. Do everything you can to reduce the heat in your home (close the drapes during the day, wear wet clothing). Sleep in the basement, in the backyard, or on the balcony. And if you can't take any of those measures, then at least make sure that your air conditioner is set for higher than your winter furnace. I can't believe how many people warm their homes or work places to 72ºF (22ºC) in the winter, then cool them to 69ºF (20ºC) in summer! It's sheer lunacy.